As we can see from this half-year, performance chart sugar couldn’t beat the VIX, which dominated the futures market by a huge margin throughout 2018. One can think that the experiment failed this time, but in my opinion, we have the wrong selection of one input. I am talking about the VIX. The thing is that the underlying asset of these futures is not a commodity, but the “Fear index” or the indicator of the risk approach. The advantage of experiments is that we can find out if something works or not. It looks like we should have pitted another commodity against sugar, which is also a commodity. 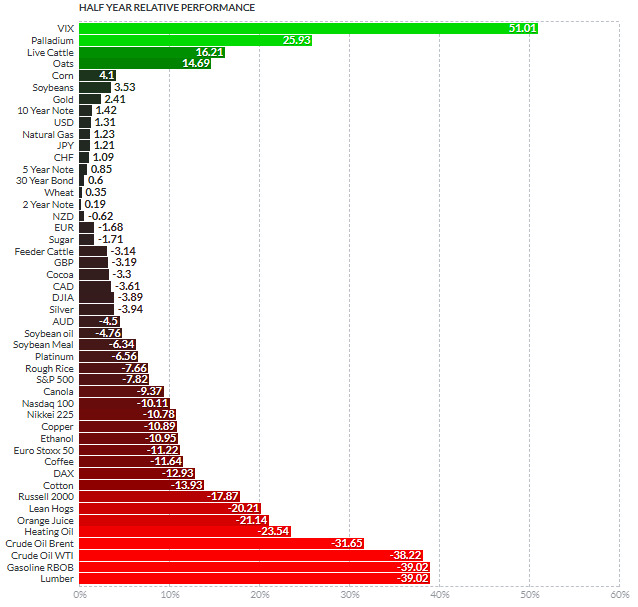 In the middle of 2018, the top dog among commodities futures was cocoa with a 31% gain while sugar was the top loser with a 20% loss. And the diagram above shows that then the Pendulum effect would work just perfectly as sugar bypassed cocoa although both futures have negative results, sugar futures have lost 1.7%, and cocoa futures lost almost double of that at minus 3.3%. So there was nothing wrong with the “Pendulum effect,” but one input was clearly erroneous. Let’s move on with new knowledge and push the Pendulum again. It is interesting that this time we have a metal among the new contestants. In prior swings, I only chose metals in the races, and that was another wrong approach, but this time it is the natural course of events. 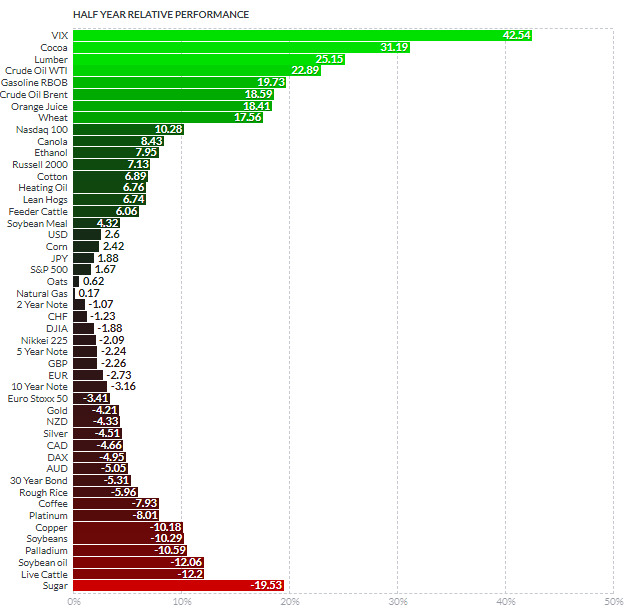 Palladium is the top commodity in the past half of the year with a 26% gain. On the opposite side in the “red corner,” is lumber with a -39% loss. Palladium is the true champion among the metals, and it is a regular participant of Pendulum experiments as it was in the very first race and in the fourth one. The metal started its strong uptrend at the beginning of 2016 from $500 oz. and its price quadrupled since then amid the environmental legislation tightening around the world. It’s the primary beneficiary of the “Diesel-gate” scandal leaked in the distant 2015 as automakers abandoned platinum in favor of palladium to avoid terrible fines. Now, we are probably in the last leg up to test the upside of the orange uptrend. A bearish divergence was detected on the RSI as we got lower tops (78 vs. 74) there. This is a harbinger of the upcoming peak of the palladium price. I added the red vertical line on the 1st of July when the experiment will finish for you to see the time limit for the price development on the chart. By that time the price could drop lower being hit with the bearish divergence. Lumber futures had a decent move up from the end of September of 2015 till the end of May of this year from the $218 low up to the $649 high when the price almost tripled. After that, there was a falling knife price action, which broke below the three-year uptrend (orange). The price found support at the round number of $300 and bounced up from there. Usually, every breakout has been followed by a pullback to the broken trendline before the price move resumes in the direction of the breakout. Besides that, we already have the first leg of a potential pullback in place. The price should hit around the $400 mark to complete the pullback, and the RSI will simultaneously retest the broken 50 area on that move. Well, ladies and gentlemen, place your bets below. What do you think will happen by the middle of 2019? Dear Mr.Oliver, thank you very much for a warm feedback. I appreciate the time you have spent to stop by and share your thoughts. Voting is a part of interaction that we all need I think. We don't move markets but we exchange views, thanks for invention of internet. Before that time we would never speak to each other, so I am happy to live these days. Have a great 2019 ahead, Allen! This whole thing is silly. Voting has no impact on the markets. You can't vote the market into bull or bear territory. Furthermore, what do 44 votes mean? This is a nice parlor game. That's all. Dear Mr.Welch, I appreciate that you shared your time and thoughts with all of us. The voting gives people an opportunity to share their views with all of us without spending too much time. Some people are shy to express their written opinion. Some people share even more leaving their comments like you and that's why I am so grateful. Have a great 2019 ahead, thanks again for reading, Carl!